Tattoos have been around for thousands of years but have become exceptionally popular in today’s society. The desire to remove tattoos has doubtlessly been around just as long as the first tattoo but could not be satisfied due to the absence of laser technology at the time. Early methods of tattoo removal included dermabrasion, salabrasion, and excision—methods that involve sanding, cutting, and burning of the skin—and resulted in scarring. Today, tattoos that were once considered permanent can now be completely removed with advanced Q-switched laser technology. Laser tattoo removal is the only effective, noninvasive method for removing unwanted ink in the skin—without causing any scarring. Our Astanza Duality is specifically designed to target ink deep in the skin and remove it faster than ever before. When a tattoo is applied, a needle penetrates through the epidermis and embeds ink into the dermis, the deepest layer of skin. Over time the ink settles more and more into the dermis while your body’s immune system tries to remove it. The reason tattoos are permanent is because the ink particles are too big to be removed by the immune system so they remain embedded in the dermis. Even though the ink particles are too big to naturally be removed, the immune system persistently tries to remove them. This is why tattoos lose color and become faded over time. 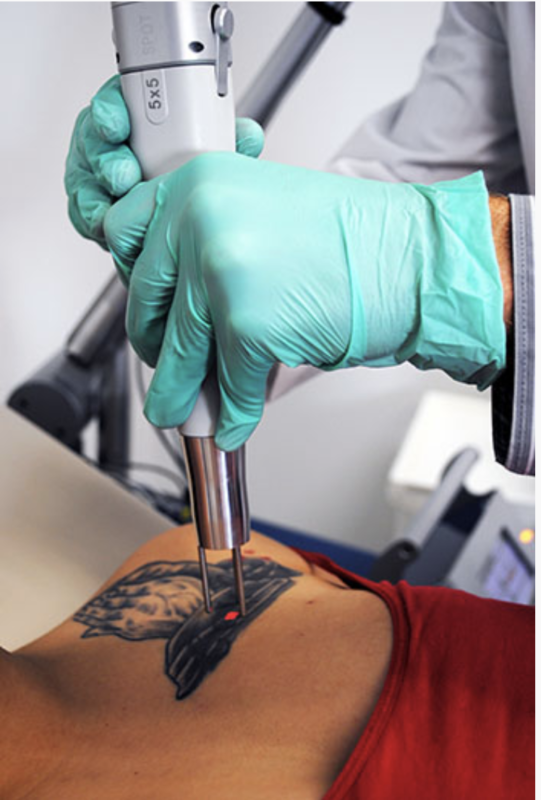 Laser tattoo removal speeds up the fading process of a tattoo by emitting short bursts of light energy into the tattooed skin and breaking up the ink particles into smaller fragments. These fragments are then small enough to be flushed out by the body’s immune system and are removed more and more after each treatment until nothing is left but clear, ink-free skin. Laser tattoo removal is the only noninvasive method that can penetrate deep into the dermis and selectively remove ink without harming the surrounding tissue. Madison Laser Tattoo Removal offers free consultations and tattoo assessments for all patients. Our facility delivers the best results for laser tattoo removal in all of Madison, Wisconsin! Our advanced laser technology and expertly trained staff makes us the best laser tattoo removal clinic in Madison and southern Wisconsin. We are not a medical spa that offers a variety of cosmetic procedures—we are a specialty tattoo removal clinic that performs strictly laser tattoo removal. At Madison Laser Tattoo Removal, getting rid of your unwanted ink is our focus and forte! © 2018 | Madison Laser Tattoo Removal | All Rights Reserved.